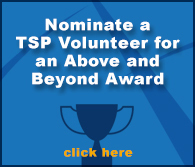 The Above & Beyond Awards were created by the Technical Standards Council (TSC) to celebrate those volunteers that have made a significant contribution or effort that advances the Technical Standards Program. Individuals are nominated by their peers within the Technical Standards Program and winners are voted on by the TSC and the Working Group Chairs. The TSP exists because hundreds of individuals from across the industry volunteer their expertise and significant amounts of time throughout the year to write standards that increase safety, solve problems, and make life easier. Art was cited for having “been a strong, supportive and tireless leader in the development of the single-conductor feeder cable standard, keeping focus on the objective of the creation of this standard over an exceptional number of public reviews while guiding the task group to respond appropriately and substantively to all raised objections.” Art currently serves as the chair of EESA, the Entertainment Electrical Safety Association, in Canada. Steve was cited for having been “instrumental in developing ANSI E1.60, Guidelines for the Use of Raked Stages in Live Performance Environments. This standard provides guidance for the use of raked stages in live performance environments to mitigate the risks for the protection of actors and technicians.” Steve took on a considerable role in moving the task group forward, producing a quality American National Standard in almost record time. Steve is a Product Liability Specialist for Chubb Group of Insurance. Keith was also cited for having been “instrumental in developing ANSI E1.60, Guidelines for the Use of Raked Stages in Live Performance Environments. 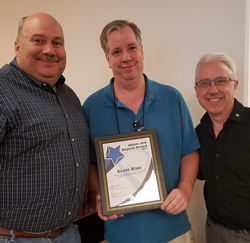 Keith went above and beyond to bring years of experience and knowledge to the creation of a standards document that will help protect performers and technicians working on raked stages. 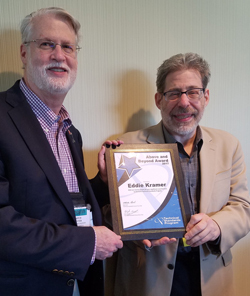 Keith’s willingness to jump into the world of drafting technical standards concurrent with his role as a Business Representative at Actors’ Equity Association is exemplary. Members Mark Ager, Dana Bartholomew, Joe Champelli, Bill Gorlin (Chair), Rod Haney, Dan Lisowski, Joe McGeough, and Orestes Mihaly. A standards project for flying performers was begun in 1997 and, after much hard work, abandoned in 2004. Realizing there was still a need for a standard Bill Gorlin and the E1.43 Task Group initiated a new project in 2013 dealing with the some of the same subject matter and, due to their hard work, commitment and dedication, were able to successfully complete this difficult and sometimes contentious project. As a significant contributor to ANSI E1.24, Dimensional Requirements for Stage Pin Connectors and the task group leader for ANSI E1.19, Recommended Practice for the Use of Class A Ground-Fault Circuit Interrupters Tyrone was cited for "volunteering hundreds of hours in pursuit of important interoperability and safety standards that have made significant contributions to the safety and well-being of the people in our industry. Ty has done so much of the heavy lifting of actual standards writing, comment resolution and draft creation for the Electrical Power Working Group. He has significantly advanced and strengthened the Technical Standards Program." Peter and Duane serve as principle and alternate voting members for ASTC and have been involved since the working group's inception." Together they have consistently coordinated their efforts and schedules to ensure attendance at meetings and to facilitate collaboration on homework assignments. We can always count on one or both of them to be there when we need them, and they each volunteer to take on assignments - sometimes taking on different assignments to help share the overall workload. They were both adamantly supportive of keeping the working group going at a time when its future was uncertain." Jason was cited for being instrumental in the development of the E1.33, Transport of ANSI E1.20 messages in an E1.31 Environment as well as assisting in the organization of web conferences for the Control Protocols Working Group and its task groups. 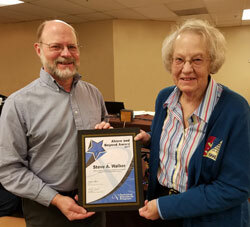 Larry was recognized for his tireless efforts to bring in financial support for the Technical Standards Program which is dependent on funding from the industry to carry out its important work. Bill has, over the last several years, put in an extraordinary amount of work in the preparation, setup, programming, and presentation of the Protocols section of the PLASA booth at LDI culminating this year in the new "Standards on the Stage" area. Simon was recognized for his tireless commitment to furthering the progress of Control Protocols. He has made major contributions to numerous standards, authored articles, participated on panels, assisted with marketing activities, and developed the open source RDM test suite software dedicated to furthering protocol compliance. Steve worked closely with Underwriters Laboratories for more than three years to get the ANSI/PLASA E1.24 Pin Connector standard to be the first PLASA standard to be adopted by UL (as an integral part of the UL498 standard) a major milestone in the history of the TSP. Additionally, Steve’s heroic efforts on UL1691 succeeded in getting the bi-national CANENA committee to change the standard to accept current industry-standard single-pole connectors. Dan was recognized for his exemplary dedication and commitment to creating quality standards. His nomination speaks volumes as it was made by a direct competitor who wanted to acknowledge the value of Dan’s contributions and participation on the Working Group. Chris has approached every project she's worked on with determination and tenacity and was instrumental in moving the E1.6 series of standards forward as well as E1.4. She's now pushing through with the Theatre Inspections document. Christine was particularly cited for her level of preparation for meetings, which allows her to make significant contributions to all discussions.